We are gathered here today–on this, the eve of that great occurrence–to commemorate that which has passed into the nether of the past. It is with great solemnity that we observe the passing of the times that we held together, yet we will endeavor to not forget that which has been, for the memories and stories that we tell will be all that remains of this glorious time. Although this time was always inevitable, the probability makes the occurrence no easier for our emotions to conquer. It is understandable that many among us are saddened; indeed, to be sad is human. We mustn’t look with total disdain upon this moment, for in the words of Carl Jung, “The word ‘happiness’ would lose its meaning if it were not balanced by sadness.” The joys of our experiences are only heightened by the downtrodden times with which we compare them. Let us be then thankful for that which we have received, and look not upon the inevitable with total contempt. Now, at the beckon of the duties that call us hither, let us hearken back to our respective responsibilities. Do not dwell on the sadness. Remember, dinner is served tonight at six. Lunch will always come again tomorrow. Go and dwell no longer on the meal that has ended. This entry was posted in Seriously? 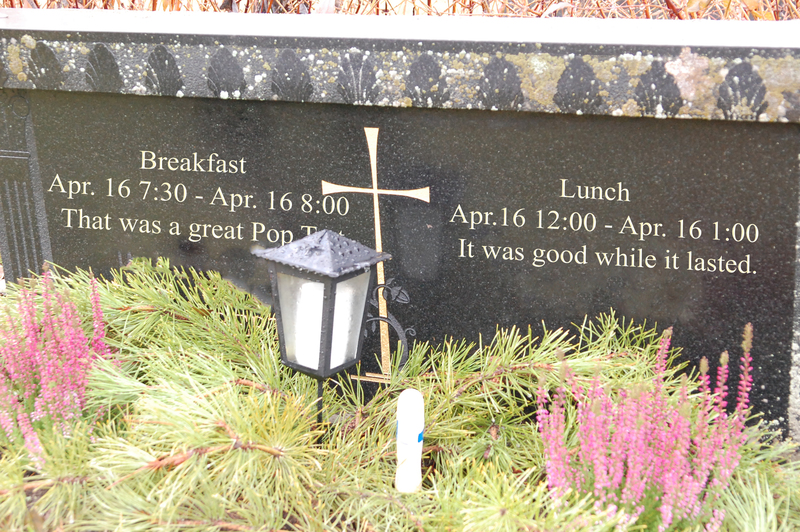 and tagged Breakfast, Dinner, Eulogy, Food, Gravestone, Important, Lunch, Pop tarts, Public Speech, Sadness, Solemn.